A “radio” receives a signal from another radio through the airwaves.Â WiFi, Bluetooth cordless phones & cell phones are all radios. In the case of a cell phone, the signal is coming from a ‘tower’ that can be up to 10 miles away. 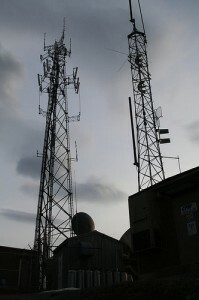 When our cell phones transmit/receive a signal back & forth to these towers, a call is completed. A wireless broadband card (also known as a USB modem / mobile broadband or aircard) operates the same way a cell phone does; it receives and sends a signal to a tower. Both cell phones & broadband internet cards are totally dependent on the carriers signal (AT&T, Verizon, Sprint, T-Mobile etc). Each carrier tries to provide a good usable signal, but unfortunately, many obstacles exist that the carrier cannot overcome: trees, valleys, hills, cement or brick buildings and buildings with metal roofs or metal siding or basements.Â These obstacles block or hinder the normally adequate signal which results in broken or dropped voice calls and very slow or non-existent internet service. An external antenna to send a signal to the cell tower. These components are joined together by coaxial cables. Home or building kits can be customized using different lengths of cable for multiple interior antennas. These antennas can be on a single floor or on multiple floors. The cost of these kits can range from $250 for a small home or RV to $2500 for a large home with multiple floors.Â Commercial buildings may require a couple of repeater kits to supply signal to areas from 20,000 to 100,000 square feet. Whether it’s mobile, home or office that leaves your phone or data card silent, we can tailor a repeater kit for you to bring those essential tools back to life!